At this age children shift from asking ‘why’ to asking ‘how.’ Teachers guide them in collecting information to come up with their own answers. Standard academics (math, language, science) are interjected with comprehensive lessons on topics that include the formation of the universe and timelines of life on earth. These Great Lessons inspire contemplation about how the world fits together, its past and present, and our place in it. Materials move from concrete to abstract concepts. Focus is on developing independence: children plan their mornings, choose their work & workspace, and meet due dates. The goal is to foster intrinsic motivation and curiosity. Morning are spent in individual or group work, and one-on-one or small group lessons with the teacher. Afternoons are for silent reading, writing, and learning with Specialists. Students keep track of due dates on their own calendars. Word Math (WM - math problems in story form) is due every Friday. Other work, such as square root or Michigan history, coincide with current lessons. 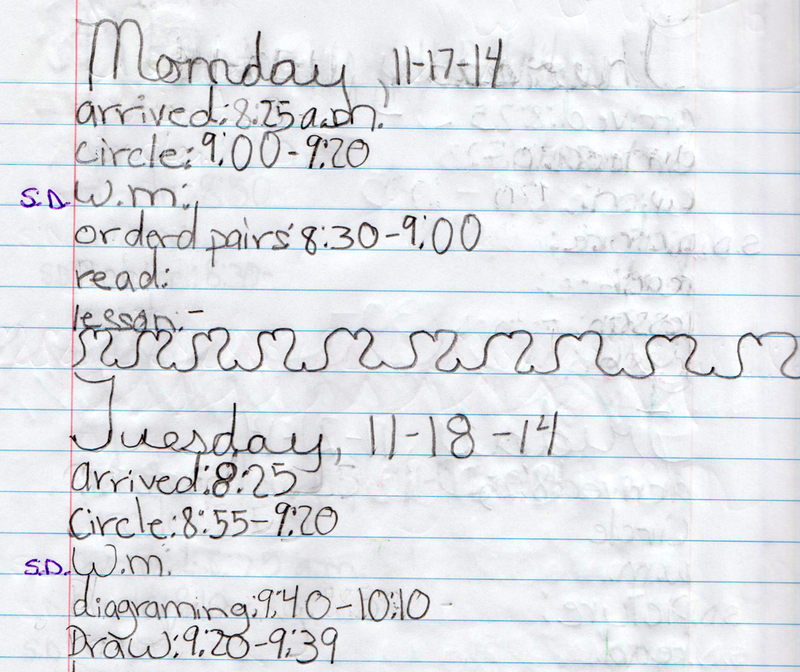 Students keep a work journal to plan their morning and keep track of how they spend their time. 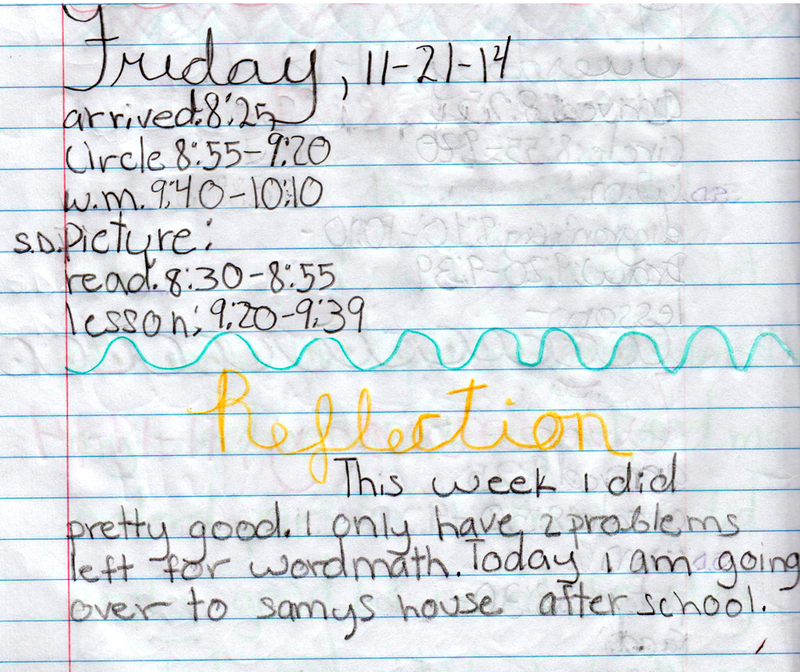 At the end of each week, students reflect on their work ethic. Through keeping work journals and calendars, they are gaining organizational and time management skills. 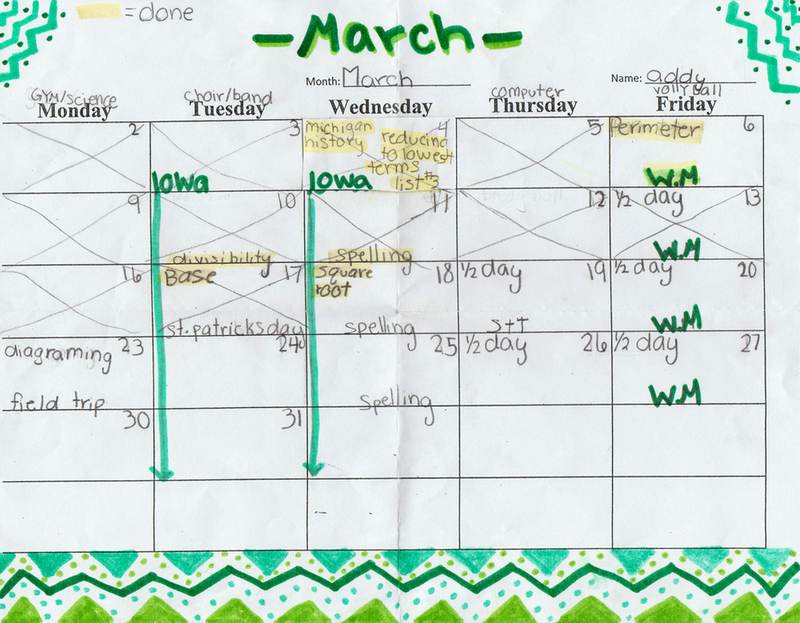 Students make their own calendars to prioritize work and keep track of due dates. They balance their time between completing lessons, doing art projects, practicing for upcoming presentations, or volunteering for community service around the school – watering plants, vacuuming, or helping other children. Scores on the IOWA test display academic readiness. Feedback from parents and students demonstrate emotional and social readiness. Listen to Sharon's (upper elementary teacher) story below about how a former student dealt with bullying.